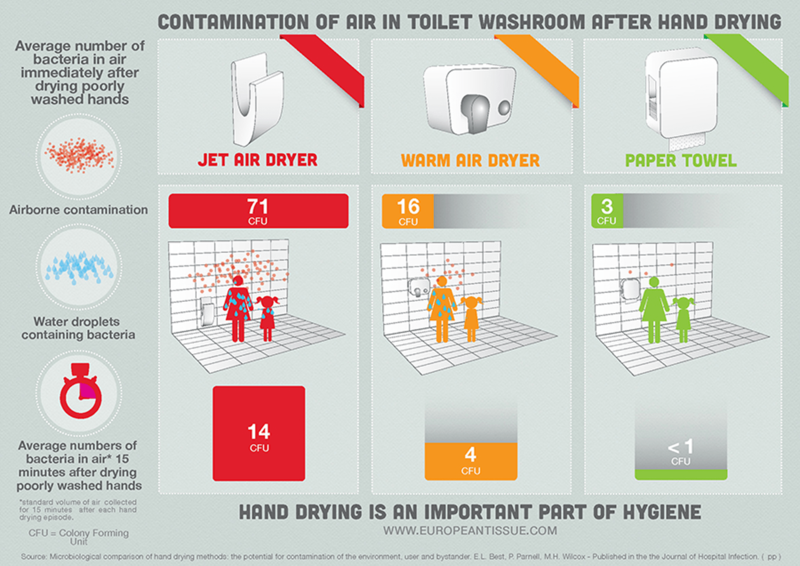 Studies confirm the superior hygiene properties of tissue paper for drying hands after hand washing in public washrooms. The European Tissue Symposium (ETS) is a trade association that has been promoting the benefits of tissue paper products for over 45 years. Our members represent the majority of European tissue paper producers, accounting for some 90% of the total European tissue production. When I took over as chairman of ETS from Roberto Berardi in June of last year, I pledged to capitalize on the awareness and goodwill he had established for the sector. We should not underestimate the importance of getting out and communicating with both end users and general decision makers, and continuing to find new and interesting ways to put our message across. I am sometimes struck that even tissue producers themselves are not fully aware of the science supporting the superiority of tissue paper products over other options. Among the various tasks we carry out, we have two immediate areas of focus: demonstrating the advantages offered by tissue paper products in terms of hygiene, and highlighting the industry’s credentials in the area of environmental sustainability. I believe it is crucial that we explain clearly to people the benefits of using tissue products. 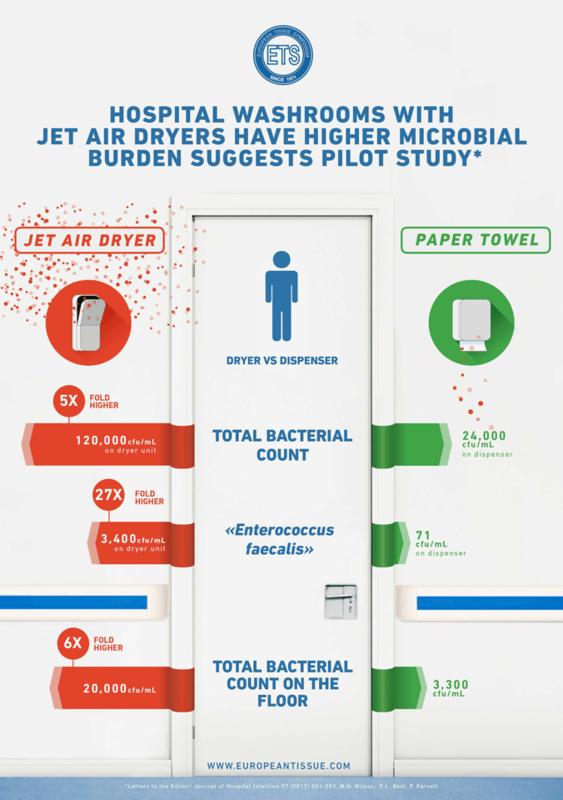 They need to be convinced of the myriad of reasons why paper offers the most hygienic option available in a wide range of applications, from toilet paper and kitchen towels to facial tissue, table napkins, and of course single-use paper hand towels. Using research studies is an excellent way to spread the word, and over the past seven years ETS has sponsored a number of independent studies conducted by leading microbiologists at universities around Europe. We have also seen similar studies or experiments performed by other organizations, like a couple of TV broadcasters in Germany. 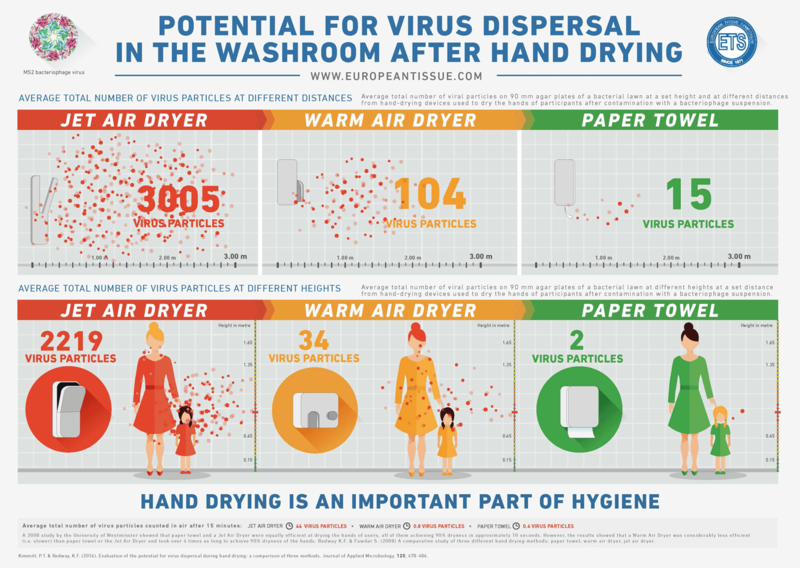 They all demonstrate and confirm the superior hygiene properties of tissue paper for drying hands after hand washing in public washrooms. Many of the studies are available in both trade and consumer media, and tissue producers from Europe, the Middle East and as far afield as Asia frequently ask if they can use the findings of the studies in their own publications. ETS is also a regular participant in events and scientific symposia, where it gets the opportunity to present the findings of its studies, and to network and exchange ideas and opinions across a wide range of subject areas. Sustainability is a key communication platform for the tissue industry, and far too many people are ill-informed of the considerable initiatives taken by our sector to drive environmentally sustainable practices. The industry’s commitment to a virtuous cycle of planting new trees to constantly replenish forests is not always understood, and there is much work to be done to address the misperception of the industry. People need to be confident that using tissue paper products will not contribute to deforestation, and that indeed the industry plants trees that absorb CO2. As a tree grows, it can absorb up to 10 times the amount of CO2 that a fully mature tree absorbs as it uses it to create the wood. Our society needs to focus not just on preserving trees, but on growing new ones too if we are to reduce the greenhouse effect and bring a healthy balance to our planet. A full range of materials on both environmental sustainability and hygiene credentials of tissue paper have been developed by ETS and are available on our website. There is also information on recycled fiber vs. virgin fibers, as well as the ETS position on forest certification, which was unanimously adopted by members on a voluntary basis well ahead of EU regulation. Traceability of production is important to ETS and to our members, and we support FSC and PEFC forest certification. On the other hand, we are less in favor of those areas of certification which are not fully under our control – such as sources of energy. Bulk certification, too, is not as simple as it may sound, and tissue manufacturers do not declare the bulk used because quality products typically come from a mixture of different bulk types, e.g. partly Canadian softwood, partly Brazilian eucalyptus. The ETS Product Stewardship committee has a leading expert in environmental affairs. 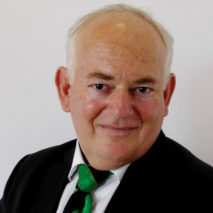 His input is a valuable contribution to the relevant regulations developments, and of course he shares the various updates in order to ensure alignment internally. Additionally, when resources availability will allow, we intend to start monitoring the perception of consumers and customers have of the environmental impact of tissue paper. ETS resources alone are not sufficient at the moment for this initiative. – Consolidation has been the mega trend in the tissue market over the past 10 years. While the European industry was initially fragmented, there have been some major changes that have resulted in players now having worldwide presence. Last year, it was announced that the world’s number one producer is now a European company, and it is an ETS member. Industry growth in Europe is relatively slow at around 1% per annum, and hence efficiency is key to maintaining a profitable business model. Companies within the sector have invested significantly in upgrading and modernizing their equipment, and this has resulted in delivering better products at a lower cost, and growing market share as a consequence. The upgrading projects will remain a part of the standard process for the tissue industry for a long time. While efficiency is crucial for all tissue business categories, it is of paramount importance in the case of private labels, where meeting the customer requirements of a quality/price balance can be challenging and have a negative impact on margins. Profitability is not something that will be easy to maintain. It will require a continuous fine-tuning of all the variables of the equation in order to keep the business viable. This is a phenomenon that was first faced by the tissue paper producers in Europe and that has now crossed the Atlantic and is challenging the US businesses too. The pressure exerted by private labels at the expense of branded products is a trend that is likely to continue, with some markets feeling the squeeze more than others. In some countries, private label represents 70% of the market, whereas in others it still represents around 50%. It is likely that the 50% market share will gradually move towards 70%, and that those already at 70% will edge towards 75%, rather than the opposite. A further emerging trend is the growing importance of the Away from Home (AFH) market. Unlike the situation in the consumer products sector, where the growth in private labels has reduced the importance of brands, this is less of an issue in the AFH segment. Currently, companies are still able to realize their potential through the creation and consolidation of their own proprietary brands. 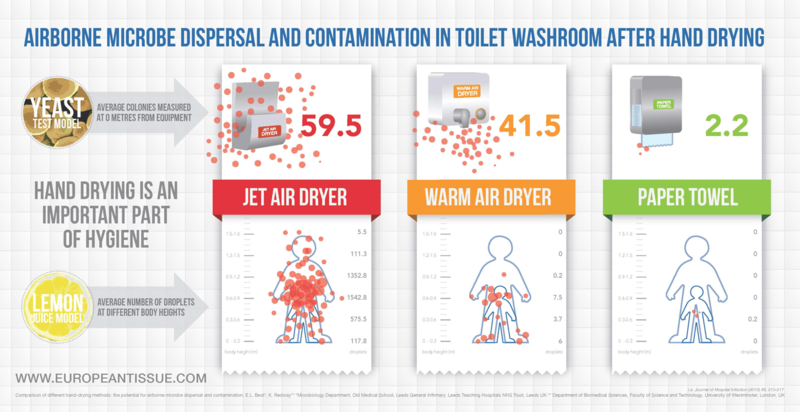 This is in no small part due to the ETS scientific studies, whose results show the hygienic advantages of using tissue paper over other hand drying methods, and are widely recognized in the AFH environment. This in turn has supported the continued success and growth of the segment, despite heavy pressure from alternative products such as electric hand dryers. We expect that the financial structure of businesses will require even more careful understanding and monitoring because of the continued pressure on the margins, mostly caused by current trade requirements in the consumer products and by increased competition across the board. This will make it even more crucial that producers and supply-chains find a way to develop, produce and deliver products with less fiber, and with more efficient, digitalized machines that use less energy and water in production. Having optimized its logistics and mills, our industry is now looking to further technologies that can support business efficiency in the sector. Smart devices that can record the number of sheets used in a towel dispenser for example are an interesting development. With the aid of digitalization, we could envision a system that sends a signal when the dispenser is for example only 10% full, so that the cleaning staff is alerted and can refill it. We are convinced that there is a host of ways in which technology 4.0 could benefit our sector – from production processes through to distribution processes and end use. In the same way, it is important that we stay connected with machine manufacturers, ensuring that they are working on relevant improvements, such as lowering energy consumption or use of raw material, hence optimizing costs while maintaining, if not improving, quality. Better products and margins will benefit the industry and consumers too. In Europe, demand is already met by existing production capacity, but if a machine manufacturer can help our members to deliver products which are slightly better than the existing mainstream, and that at a lower cost, then they will have be a good opportunity to sell new equipment. In developing countries where the capacity increases every day, opportunities for investment are greater as tissue producers constantly need to increase capacity volumes. I have had the privilege to work in the tissue business for many years. It is a fascinating, multidimensional business with a culture of novelty and continuous improvement despite the deep knowledge accumulated so far. I am very positive about the industry’s future and its ability to continue to make a useful contribution to society through both its product hygienic benefits and its optimum environmental impact. The European Tissue Symposium (ETS) is a trade association, organized as a non-profit association under the Belgian law and located in Brussels, Belgium. ETS members represent the majority of tissue paper producers throughout Europe, and about 90% of the total European tissue production. Founded in 1971, ETS has been based in Brussels since 1992 where it is at the heart of Europe and close to the European Community with whom it engages on a regular basis.